For the stage that originated in Super Smash Bros. Melee, see Mute City (SSBM). Mute City SNES across the series. Unlock criteria Win three Smash battles with Captain Falcon. Mute City SNES (ミュートシティ SFC Mute City SFC), previously referred to as Mute City (ミュートシティ Mute City), is a stage in Super Smash Bros. for Nintendo 3DS and Super Smash Bros. Ultimate. 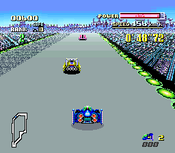 It is based upon the Mute City track in the original F-Zero game for the SNES. In Ultimate, it is renamed to distinguish it from the similarly named Melee stage, despite the fact that the Melee version is not in the game. The stage consists of a racer below acting as a platform, flanked by two floating platforms at slightly different elevations swaying to and fro above it. The racer perpetually drives laps of the original Mute City track, occasionally getting sideswiped by other racers, which act as additional platforms. When two racers are onscreen, one will eventually be driven off the track and therefore off past the blast line, as indicated by the word "CHECK" pointing to the racer about to be shoved off. If a racer drives over the track boundaries, any player standing on it will suffer moderate damage and knockback. In addition, the main racer will occasionally drive over a ramp and be popped into the air, during which its sides and bottom will become active hitboxes until it lands back on the track. Also, the racer will race through the pit stop every other lap, indicated by a beam of light repairing the vehicle. During this short period, the beam's source acts as a barrier that will bounce launched players headed in its direction back. Throughout the stage, players must take caution to avoid touching the road, which will cause heavy damage and vertical knockback, similarly to a couple past F-Zero themed stages in the series. Additionally, there is still a bottom blast line below the road that players can be KO'd through, if a player falling downward misses the track boundary. In Super Smash Bros. for Nintendo 3DS, the Ω form has players fight on a single, yellow-colored platform. The stage now has a consistent bottom blast line and no other racers show up other than the Blue Falcon, Captain Falcon's F-Zero machine, which can still be seen racing around the track. In Super Smash Bros. Ultimate, the main platform of the Ω form and Battlefield form is similar to the Ω form in SSB4; however, it is resized and reshaped to match Final Destination and Battlefield, respectively. The three soft platforms are based on the two soft platforms of the normal form. The characters are still flat, which also flattens the hitboxes and alters gameplay significantly as a result. Mute City 1 as it originally appeared in F-Zero. 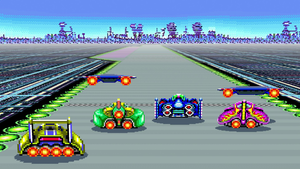 This stage is based on the track Mute City 1 from F-Zero, and is graphically taken straight from the game in its original 2D appearance. The Blue Falcon, along with other F-Zero machines appear on this stage and are also directly based on their 2D sprites from F-Zero. This stage is banned from all tournaments barring the Gentleman's Clause because of many reasons. There is no bottom blast zone which is usually an automatic ban, inconsistent platforms in the racecars that can carry fighters to their doom, and the track itself deals moderate damage and knockback if touched. Mute City trophy in for 3DS. F-Zero is an interstellar race spread over nine different planets. The Blue Falcon sprints through Mute City, the first circuit in the Knight League. Fighters must do battle as they move between the various racing machines, being careful not to get knocked off and left behind in this high-speed stage. A metropolis in the heart of the Space Federation, where all the racing leagues begin in the original F-Zero game. In this tricky stage, you fight on top of the Blue Falcon as it thunders along the track, switching to different vehicles suddenly as the race rages on. Whatever you do, don't fall onto the track. That's sure to hurt! Mute City in Super Smash Bros. for Nintendo 3DS. Ness and Mario battling on Mute City. If a player is invincible and stands on the road, they can quickly move to the left or right, easily causing a self-destruct. This is due to the F-Zero Racer on the stage constantly turning, causing the track to quickly twist when the racer turns, especially on the sharp bend. In fact, the milestone for unlocking this stage even warns about this. This stage received a name change in Ultimate for disambiguation, but the stage whose name it shares, Mute City, does not itself appear in Ultimate. All other stages with name changes appear in Ultimate alongside the stage they were disambiguated from (for example, Kongo Falls and Kongo Jungle). In Super Smash Bros. Ultimate, Mute City is not used for any character's Classic Mode route in any form. Even with hazards off in Ultimate, the road still damages players. In Ultimate, players are two-dimensional and have flattened hitboxes. This page was last edited on April 17, 2019, at 02:17.